Nomadic pastoralism has thrived in Asia’s rangelands for several millennia by tracking seasonal changes in forage productivity and coping with a harsh climate. This pastoralist lifestyle, however, has come under intense transformations in recent decades due to socio-political and land use changes. 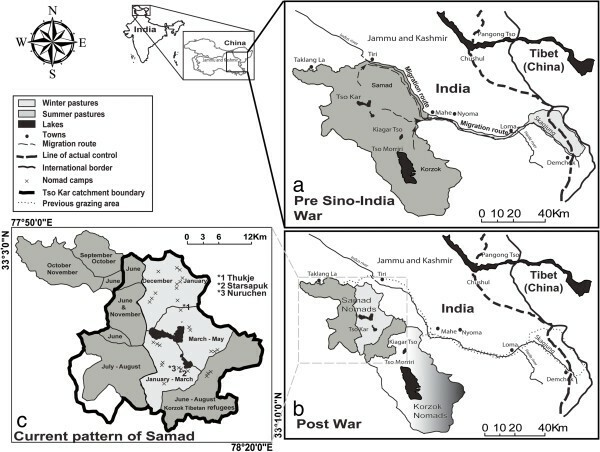 One example is of the high-altitude trans-Himalayan rangelands of the Jammu and Kashmir State in northern India: major socio-political reorganisation over the last five decades has significantly impacted the traditional pasture use pattern and resources. We outline the organizational transformations and movement patterns of the Rupshu pastoralists who inhabit the region. We demonstrate the changes in terms of intensification of pasture use across the region as well as a social reorganisation due to accommodation of Tibetan refugees following the Sino-Indian war in 1961 to 1962. We focus in particular on the Tso Kar basin - an important socio-ecological system of livestock herding and biodiversity in the eastern Ladakh region. The post-war developmental policies of the government have contributed to these modifications in traditional pasture use and present a threat to the rangelands as well as to the local biodiversity. In the Tso Kar basin, the number of households and livestock has almost doubled while pasture area has declined by half. These changes have potentially negative consequences for the long-term resilience of nomadic pastoralism as well as for the survival of rare local wildlife. To increase the pastoralist standard of living, having fewer pastoralists may be the only solution, and alternative livelihood options may bring this about. Development programmes should concentrate on enhancing opportunities for herders so that there is a greater diversity of employment opportunities and potentially better chances for the persistence of biodiversity. Over the course of the last five decades, pastoralist lifestyles around the world have been influenced by changes in socio-political circumstances leading to changes in pastoralist rangeland use practices (Behnke and Scoones 1993; Robinson and Milner-Gulland 2003; Namgail et al. 2007a). Commonly observed impacts of such changes are reductions in pasture turnover, sedentarization of nomadic pastoralists, increased livestock populations and conflicts with wildlife sharing similar resources. For instance, changes in government in the former Soviet Central Asian republics have been traumatic not only for the pastoralists but also for the pastures and wild herbivores such as the highly endangered saiga antelope (Saiga tatarica) (Milner-Gulland et al. 2001; Kerven 2003; Robinson and Milner-Gulland 2003). The curtailment of pastoralists’ movements after the end of the USSR, following the previous Soviet collectivization of livestock to increase the livestock production, ended in a near disaster, ecologically and economically for Central Asia rangelands (Ellis and Lee 2003; Kerven 2003). Similarly, official pasture use policies in Chinese Tibet have seen dramatic changes in the recent past, with the fencing of winter pastures for livestock and changes in rangeland management goals, leading to sedentarization of pastoralists and endangering local flora and fauna, such as the emblematic migratory Tibetan antelope (Pantholops hodgsonii) and wild yak (Bos grunniens) (Bauer 2005; Xu et al. 2009; Fox et al. 2009). In parts of Central Asia and Himalaya, studies have demonstrated that intense livestock grazing may pose a serious threat to wildlife resulting in their decimation or even local extinction (Mishra et al. 2002, 2004; Bhatnagar et al. 2006a). Overall, the recent fast pace of perturbations that have occurred in Central Asia coupled with conflicting needs between the intensification of land use and low productivity ecosystems challenge our understanding of the spatial and social extent of the above changes. Hence, there is room for integrative and ecosystem level analyses of these transformations despite the paucity of data so as to obtain a better understanding of the state of the systems and the causes of changes. A better understanding could contribute to long-term co-existence of pastoralism and native wildlife in the region through implementation of effective management plans. We address this issue using the case study of the socio-ecological pastoral system of Rupshu pastoralists in the high-altitude rangelands in the Indian trans-Himalayan region of Ladakh, Jammu and Kashmir. This region has undergone socio-political reorganisations and increasing developmental interventions by local and national governments. This, along with other anthropogenic pressures such as population growth, increasing demands for goods and services and education, has led to a rapid change in the pastoralist lifestyle. 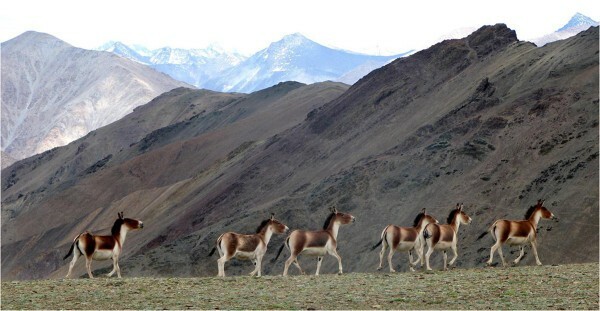 Nomadic pastoralism has existed in high-altitude rangelands of the trans-Himalayas and Tibetan plateau for several millennia (Miller and Schaller 1996). The pastoralist lifestyle has subsisted in these highly seasonal and unpredictable environments, managing the uncertainty and risk and converting sparse vegetation into livestock biomass (Miller and Schaller 1996). With a short growing season and a limited range of elevations at which livestock can graze, pastoralists practised well-defined movement, tracking the changing seasonal and spatial variability of resource quality and quantity and seeking to overcome unpredictable events such as drought, snow disasters and predation (Schaller 1998; Hagalia 2004). The main of changes in the pastoral practices of Rupshu has been the Sino-Indian war of 1962 which affected core area near the Indo-Tibetan border historically inhabited by the Rupshu groups in Ladakh. A number of other consequential changes occurred as a result of the war, which were also socio-political in nature (Bhatnagar and Singh 2011). We present this case study, taking Rupshus as a model, showing how externally generated shifts in pastoral practices could affect the local wildlife, including some species of conservation importance, which compete for the same resources as livestock. We examine the changes in a spatial and social context over the last five decades, compare the historical trends with the current state and quantify the changes in terms of increased grazing intensities in the area. We then demonstrate the effect of the changes in pasture use patterns on biodiversity by using Tibetan argali - a species of wild sheep (Ovis ammon hodgsoni) - as a case study and studying spatial interactions between argali and livestock. Combining literature reviews and field investigations, we discuss both ecological and social elements, for management policy formulation. Our focus area is the Tso Kar basin, an area inhabited by one of the Rupshu subgroups which has experienced changes in pastoral practices while containing key biodiversity elements of the region between India and China (Singh 2008). The Rupshu groups of pastoralists inhabit the trans-Himalayan region of Ladakh, a part of which is known as Changthang (‘northern plains’) in the state of Jammu and Kashmir in northern India (Figure 1). The Changthang region is not an administrative zone but the western extension of the Tibetan plateau, an important highland grazing ecosystem (Goldstein and Beall 1990). Rupshus are ethnically Tibetan who migrated to the Indian part of the Changthang in the eighth century (AD) (Jina 1995; Chaudhuri 1999, 2000). They are among the few nomadic pastoralists left in India (Ahmed 1996). In their political system, the traditional structure (village council with a chief/goba and village administration) and the government-sponsored local bodies (panchayats) coexist, but with differing roles. A picture of the study area. It is difficult to separate causes and consequences as the events and changes have occurred often simultaneously over the past five decades. Our analysis demonstrates the critical interplay between the three main stakeholders in the pastoral system: the pastoralists, legal bodies and government, and wildlife, all interacting with each other. We use the term ‘ecological stakeholders’ to encompass the rangelands and its wildlife. To help understand the context and the pastoral changes, we provide a chronology of events as a general and historical framework (Figure 2). 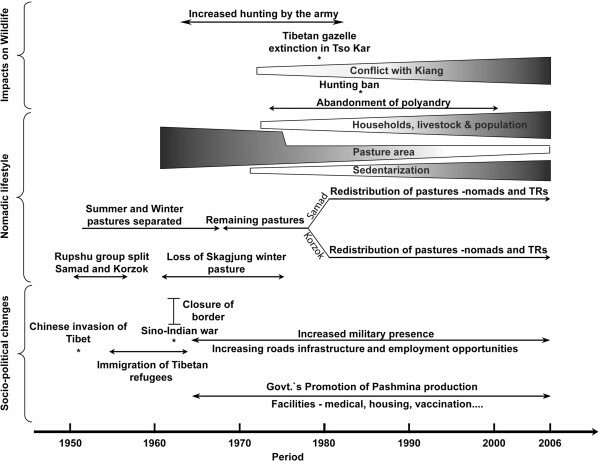 Chronology of events in the Changthang region from the 1950s onwards and their consequences. The changes occurred at three levels in parallel- at socio-political, Nomadic pastoralists' lifestyle and local flora and fauna. From 2004 to 2008, we conducted 80 semi-structured interviews that included Rupshu pastoralists (in two villages of Samad and Korzok that reside in the area; Figures 1 and 3 show the study area), Tibetan refugees and government officials of the Wildlife Protection, Sheep Husbandry and Animal Husbandry Departments (the State of Jammu and Kashmir, India). Our aim was to document the post-1962 war perceived changes in pastoral practices. Two officials from the Sheep Husbandry Department, Leh, were also interviewed in August 2006 to gather information on recent governmental interventions aimed at developing livestock production. We also reviewed land use and socio-economic reports as well as the livestock data available at the local Sheep and Animal Husbandry Departments. The information on past pasture use, migration patterns and socio-economic changes was provided by six elderly people from the community. The contemporary patterns were described by the community head, the Lama (priest) and ten young educated herders. Information on family size and livestock holdings was obtained from an adult member of each family (Samad village: n = 22 local pastoralists, ten Tibetan refugees; Korzok village: n = 20 local pastoralists, ten Tibetan refugees). Livestock grazing around the lakes in the study area. We report livestock in terms of sheep (or goat) units (hereafter SU) and convert yaks and horses on the basis of 1 yak = 4 SU and 1 horse = 6 SU, as suggested by Long et al. (1999). Information on time spent (number of days) at particular seasonal locations and pastures was obtained from the village goba. We used the digital elevation model from the Surface Radar Topography Mission, NASA, for the Ladakh region, and based on information collected from herders, we mapped seasonal pasture use polygons. All the numbers are approximations. For detailed information on the land use of the Tso Kar basin by Rupshu members from Samad village, we recorded global positioning system (GPS) locations of the herder camps from 2005 to 2007 during the summer season and generated an accurate map of the movement patterns of the nomads as well as camp site locations in the Tso Kar basin (Figures 1 and 4a,b). Herders confirmed that these camps were regularly used over the years. Map of the nomads’ movement patterns and camp site locations in the Tso Kar basin. (a) Pre- and (b) post-Sino-Indian war pasture use of Rupshu nomads (Samad and Korzok). (c) Seasonal movements of Samad nomads are presented in detail for the Tso Kar basin, eastern Ladakh, India. This figure is a first step toward mapping the migration routes of these nomads (see Table 2). We estimated the seasonal pasture use of argali and livestock to calculate the extent of range overlap among the groups in the Tso Kar basin. We used argali as an example as it is one of the most important species of conservation importance in the area (Singh 2008). The area contains 29 designated camping sites for nomads and Tibetan refugees (Table 1, Figure 5a). These camping sites are distributed all over the study area and are used in different seasons. One camping site may be used by several nomadic households. To estimate the livestock range around camp sites as well as extent of resource exploitation, we made a spatial projection of the grazing intensity around herder camps (Figure 5b). In the absence of measures of actual forage removed by livestock and livestock group movements, a surrogate variable related to the ‘intensity of use’ reflects the grazing pressure on the pastures. We assumed that areas experiencing higher resource exploitation should be shown as areas that have been used more heavily (higher number of livestock) and for longer periods. The intensity could then be expressed as number of Sheep Unit Days (SUD) per site. Also, the distribution of grazing pressure needed to be determined in order to distinguish between grazing-induced depletion, seasonal fluctuations and changes that were due to other reasons. We recorded the number of families residing per camp site, livestock holding per family (SU) and time spent per camp site (number of days). Hence, grazing pressure was estimated as a function of SUD per camp site (Table 1). SU, sheep units (total number of livestock including sheep, goat, yak and horse); SUD, sheep unit days (measurement of time spent by livestock at a camp site). 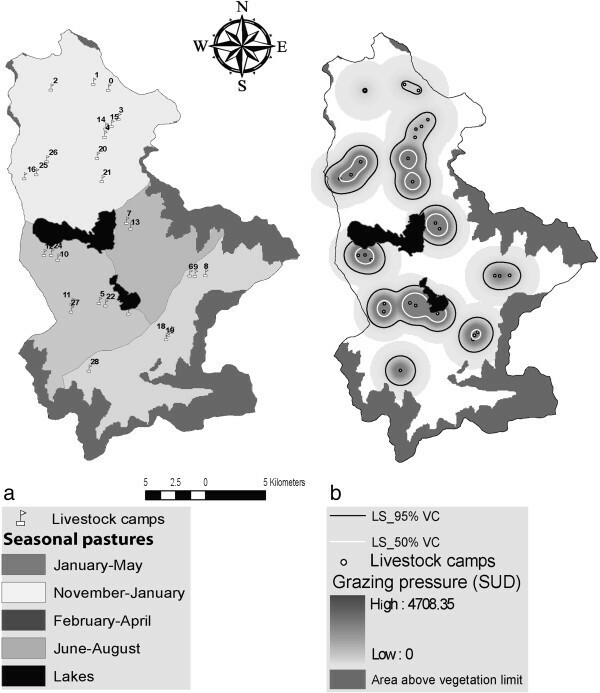 Maps showing seasonal pastures and utilisation distribution. (a) Seasonal pastures in winter, nomads’ camp sites locations. (b) Utilisation distribution of livestock around camp sites, estimated based on grazing pressure (calculated as SUD) with 50% and 95% volume contours (VC) calculated using kernel density estimation. where A1 is the area of argali utilisation distribution (UD) polygon and A2 is the area of livestock UD polygon. The UD provides a global but static (time-integrated) representation of space use patterns of animals that perform home range behaviour (Worton 1989). We assessed the OI bounded by the 50% and 95% volume contours of the two UDs. Overlap among the seasonal polygons was estimated using intersect tool in the ArcToolbox in ArcGIS 9.2. Historically, the 80 sampled households of Rupshu pastoralists used ca. 4,480 km2 of pasture area during their annual movement cycle (an area stretching from the Taklang la (mountain pass) in the west to Skagjung, 80 km in the east, near the Tibetan border - see Figure 4a) (Sabharwal 1996; our GPS measurements). Of the total area, ca. 3,500 km2 (extending from Taklang la towards the Tso Kar and pastures around Tso Moriri) was used by livestock from May to September, corresponding to 165 consecutive grazing days (Figures 4a and 5a). These 80 families, with about 60,000 SU, together migrated to Skagjung during winter to escape harsher conditions (October to April), undertaking a journey that lasted 20 days (both ways) and using pastures covering 987 km2. The pastoralists typically spent 180 grazing days at Skagjung before returning westward in the spring. This Skagjung area was used in winter due to its vast expanse of high biomass sedge meadows and reduced snow cover, hence providing plentiful forage for the livestock during this lean season. Another important feature of this wintering area was its proximity to the Chinese Tibetan side for trade, when the Indus River froze and provided access through its north bank to Tibet. In contrast, the Tso Kar basin in the west was only used for a very short duration, during migration (Figures 4c and 5a). "the throw of the dice demonstrated divine sanction, in that the gods spoke through the dice and so their word was final in the decision-making process". Some Rupshu pastoralists also claimed that the dice was a more democratic way of selecting the goba since each candidate had an equal chance of being selected. Below the goba, there is the assistant to the chief and kotwal (who maintains law and order). While there is always one kotwal, there can be two members depending on individual chief’s responsibilities. Apart from this, each place also elects a rta-rdzi (horse herder) and dkor-pa (one who looks after the village monastery’s livestock). A very important part of the goba and village council’s role is to enforce day-to-day issues: regulating movements of herds, deciding on important dates of harvest, festivals, fines and punishments. Their role is a vital part of the traditional society. In 1951, China’s occupation of Tibet triggered the immigration of Tibetan refugees into India (Figure 2). Some pastoralists entered through Ladakh, accompanied by thousands of their livestock. Border disputes between China and India led to a war in 1961 to 1962. The dispute resulted in increased military activity and closure of borders in the traditional winter pasture areas of Skagjung used by the Rupshu herders (Figure 4a). The war led to the realignment of previous international borders, and a large part of Rupshu’s winter pastures was lost to China during this realignment. As a consequence of the war, the supply of high-value cashmere wool to Ladakh - a traditional major import from Tibet - virtually ceased. In response, the Jammu and Kashmir (J and K) government initiated the development of pashmina or cashmere production in the Changthang region, focused towards the rearing of cashmere goats. Pastoralists and government claimed that the governmental policies, besides focusing on cashmere, were also aimed at ameliorating the welfare of the pastoralists and their livestock through extended medical care and a public distribution system that brought a variety of subsidised rations, including rice, wheat, sugar, salt and kerosene, almost to the doorstep of the nomads (Chaudhri 2000). The Jammu and Kashmir government also implemented strategies to sustain livestock numbers and increase their survival by establishing sheep and animal husbandry units, providing vaccination for livestock, establishing fodder farms and providing supplementary forage and monetary compensation for livestock losses due to severe winters and predators. In the past, the Rupshu society practised fraternal polyandry where brothers usually married one woman as a way to restrict the number of individual households and avoid the division of limited property (livestock) and resources (Goodall 2003,2004). Pastoralists believed this practice kept an upper limit on the number of families and guaranteed that family wealth remained inside the same core family. They also believe that such a marital system easily translated into environmental and grazing pressure limitation, keeping the livestock numbers in check indirectly. However, this practice was outlawed by the local government in 1941, but the ban was not implemented till the 1970s. The practice has been discontinued now. The above events have had multiple consequences. The foremost was the loss of pastures (in the form of territory of around 37,500 km2 lost to China, Figures 2 and 4a,b) but also an increase in the number of households and livestock (in most households an increase by 600 livestock per household) in the entire eastern Ladakh due to immigration of Tibetan refugees. The household number has almost tripled since the 1950s. The Rupshu group grew from its pre-split of 80 households to 212 (72 in Samad and 140 in Korzok villages, respectively) by 2006 with additional Tibetan refugees (30 in Samad and 72 in Korzok) being accommodated (Figure 6). Government records confirmed that livestock numbers in Ladakh (including Changthang) more than doubled from ca. 212,500 in 1977 to 487,000 in 2006. The Samad and Korzok groups in 2006 owned approximately 18,500 and 49,000 SU, respectively, compared to 14,700 and 26,250 SU in 1977 (Sheep Husbandry Department - Nyoma 2006; our survey), an increase of about 65% (Figure 6). Changes in the number of households, livestock populations, pasture area and livestock grazing intensity. The government created social infrastructure, which provided new working opportunities in medical, sheep and animal husbandry departments, as well as in physical infrastructure (roads and buildings, Figure 7) and the tourism industry (e.g. guides, porters and horsemen). This led to a flux of immigration from other areas of Jammu and Kashmir as well as other parts of India. Additionally, prior to the government cashmere development policies, Rupshu households kept large herds (up to 750 heads of livestock, with a ratio of three sheep/one goat), primarily due to the low value for the Indian cashmere as the bulk of high-quality fibre came from western Tibet in China. However, following the promotion of cashmere production by the Jammu and Kashmir State government, as well as market changes (e.g. reduction in demand for sheep wool from the Himalayan foothills), herd composition has changed to three goats/two sheep as pastoralists now prefer cashmere goats over sheep. 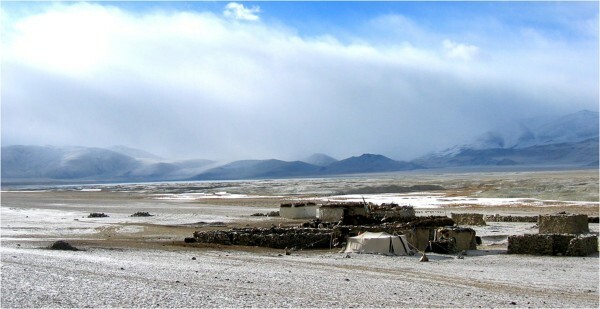 A Rupshu camp site with a stone building. The average livestock holdings per household had, however, fallen by 30% in the 1990s due to the abandonment of polyandry and the resulting division of herds (our survey). Still, total livestock numbers continued to increase during this period through the addition of livestock from the Tibetan refugees’ holdings and government cashmere development programmes. Due to the loss of the extensive winter pastures, which now lay at the frontier with China and hence rendered unavailable for grazing (987 km2 pre-war) (Figure 4b), both the Samad and Korzok groups are now confined only to their earlier, non-winter pastures (3,502 km2). These remaining pastures had to be reallocated for year-round use, and overall, the pasture area was reduced to a third of its original size for Samad (from 1,500 km2 to 500 km2) and three-fourths (from 2,000 km2 to 1,500 km2) for Korzok groups, respectively (Figures 4b and 5a). This redistribution of pastures inevitably resulted in an additional significant increase in grazing pressure, as areas formerly used during one season began to be used all year round by more families. In terms of numbers, the grazing intensity in winter for Samad group (including the refugees) almost doubled following the war, while it increased by 25% (Figure 6) for the Korzok (including the refugees). 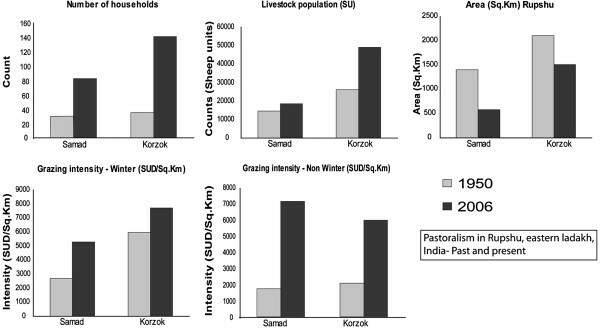 For areas used during the other seasons, the grazing pressure for the Samad group increased by almost four times whereas pressure for the Korzok group tripled (see Figure 6). Preceding the 1962 war, the Samad group used the Tso Kar basin (Figures 1, 4c and 5a) as a summer pasture for a short period (10 to 15 days) and a place for collecting salt. It was mainly used during the migratory period to and from the winter pastures. With migration to Skagjung no longer an option, the entire basin of the Tso Kar lake and adjacent valleys is now divided into seasonal grazing units to be used all year round by Samad pastoralists, hence abandoning the earlier migrations which were driven by pasture quality (Figure 4c). The area is presently divided into four sub-areas during winter. The pastures immediately surrounding the lakes are reserved for the winter months (December to April, ca. 150 days). This is essentially because the lowest-lying snow-free areas support relatively good-quality forage, including productive marsh meadows around the lakes. In total, nomads and Tibetan refugees use 29 camp sites within the Tso Kar basin, including three primary locations (1, 2 and 3 in Figure 4c) with permanent houses and corrals where, at least, part of each nomad family lives throughout the winter. The summer pastures are grazed ca. 215 days per year and extend out of the basin towards the west towards the Taklangla valley, with an area of ca. 582 km2 (Figure 4c). These pasture use changes have caused frequent movements of herds (about eight to ten times annually) within the Tso Kar basin itself, now causing intensified utilisation of the area and allowing little rest for the pastures (Figure 4c). Also, the entire basin area of Tso Kar and adjacent valleys is used all year round, with the exception of a small area in the southeast and the drainage of the Nuruchen River in the south, which are used by Korzok people in summer (Figure 4c). The eastern sub-area includes moist sedge meadows near the freshwater lake (Tsatapuk Tso) and is generally kept as an emergency grazing area in case of extreme snow events (March to May area; Figure 4c). There was a clear separation between the core area contours of argali and livestock distributions during summer and winter (indicated by 0% to 13% overlap, Table 2) (see Additional file 1 for detailed results). 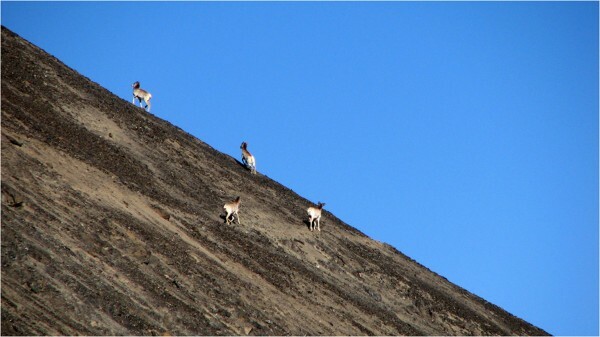 Argali in summer barely ranged in areas used by livestock in winter. While other factors such as predation risk from wolves (Canis lupus) may explain the limited overlap, the minimal overlap (4.6%) between 50% VCs for summer argali and winter livestock suggests that this pattern may be due to exploitation of resources by livestock during winter and hence lower forage available for argali during summer (Figures 8 and 9). In the Tso Kar basin of Eastern Ladakh, India. Maps showing utilisation distributions of argali ( O. ammon hodgsoni ) and livestock during summer and winter seasons in study area. Female Tibetan argali ( O. ammon hodgsoni ) in the study area. As a consequence of the 1962 war, the Indian army has been present since the early 1960s and has provided alternative employment opportunities for the pastoralists in their camp support and logistics, hiring pack animals and porters. With increasing development (road construction, road maintenance, other infrastructure construction) in the region, additional options for labour are also becoming available. Such exposure to alternative jobs, education and interactions with outsiders has resulted in a reduction of manpower per family among the herders due to emigration. With the government’s initiative to develop Changthang for cashmere production, the focus of the Kashmiri weavers is now on Changthang, which has led to an increase in demand as well as prices for cashmere. Thus, a market-based economy has replaced the traditional system of barter and exchange for Rupshu. As a consequence, the pastoralists have started owning more goats and fewer sheep, hence changing their livestock composition. However, goats have a more serious impact on the pastures compared to sheep due to their generalist feeding habitats and higher forage consumption (Schaller 1977; Animuta et al. 2005). Unsurprisingly, complaints of pasture degradation from herders have been heard more frequently since this change, even though wild herbivores such as kiang (Equus kiang, Figure 10) are usually blamed (Bhatnagar et al. 2006b). Kiang ( Equus kiang ), a dominant large herbivore in the study area. To provide aid and facilities to pastoralists, permanent or semi-permanent places were constructed (such as schools, Public Distribution Stores - from where sugar, flour and other essential grocery items are provided at subsidised prices - health and veterinary care centres, warehouses for emergency feed, etc.). This has favoured a more sedentary way of life for the nomads. Three such sites have been developed in the Tso Kar basin (sites 1, 2 and 3 in Figure 2c) along with one medical and one sheep husbandry facility for pastoralists and their livestock at site 1 (Hagalia 2004). The government provides a subsidy for permanent houses to the pastoralists near public distribution centres. Almost all nomadic pastoral groups in Changthang now have a fixed village space, generally a primary winter camp site with stone houses, where they store their belongings and return to periodically. In parts of Changthang, herders have started cultivating barley, which is increasingly becoming an important avocation for them and beginning to influence their choice of movement so that help is available for work in fields during critical periods such as ploughing and harvesting. The hay also provides important emergency fodder for winter. This pattern itself is interesting to observe as it had been formulated by herders so as to accommodate the refugees, not degrade the pastures, as well as keep emergency pastures in case of extreme winters or summer droughts. Nevertheless, how long the realigned pastures in the intensive study area can sustain the increasing grazing pressure is to be seen, and may require accurate monitoring of pasture quality and productivity. This increasing sedentarization of nomads has increased the grazing pressure near the settlements (Figure 2c, Additional file 1). On the other hand, this change needs to be carefully promoted as cashmere remains the most important product of high economic value for the Ladakh region. To continue producing cashmere of fine quality, the pastoralists need a migratory strategy, quite contrary to the idea of settling down to receive medical aid and livestock husbandry facilities. The increased overall development of the area and better education opportunities for pastoralists’ children, health care and an easier life away from a harsh environment are prompting pastoralists to migrate to towns. In addition, young adults have become dismissive of their parent’s way of life and see it as being laborious and old-fashioned (Ahmed 2005). As parts of families are moving away from Changthang, the system of family cooperation is disintegrating as there are fewer members available to continue herding (our interviews). In summary, the pastoralists are facing consequences of increased human and livestock populations and decreased pasture resources to sustain them, along with changes in their society. The government has intervened to meet the economic demands and development of the region and its people. The increasing livestock population and sedentarization of pastoralists have resulted in substantially higher grazing pressures in many areas, causing problems of resource (forage) depletion and pasture degradation. The ecological impacts of overgrazing generally include reduced plant cover, modification of plant species composition, increased erosion and decreased water infiltration (Bagchi and Ritchie 2010). Overgrazing may also accelerate plant succession towards less palatable plant communities (Briske and Richards 1995; Risser 1988). These impacts of overgrazing often occur concurrently and may be synergistic rather than additive (Noss and Cooperrider 1994). During interviews, Rupshu pastoralists indicated inadequate precipitation in recent decades and increasing competition from wild herbivores. However, no detailed studies in the area yet indicate changes in precipitation patterns during the last four decades, and global circulation models predict an increase in winter precipitation in the near future (Xu et al. 2009). Overall, with multiple and almost simultaneous disturbances (climate change, higher grazing pressure and habitat modifications), it remains a scientific and management challenge to predict the future of the rangeland dynamics in the area. Our investigations, as well as others, indicate that livestock exclude wild herbivores such as argali from the best pastures and perhaps also reduce the total amount of available forage (Bhatnagar et al. 2006a; Namgail et al. 2007a). On the contrary, Rupshu pastoralists increasingly complain of wild herbivores such as kiangs (Equus kiang) and marmots (Marmota himalayana) as the main competitors for pasture resources (e.g. Bhatnagar et al. 2006b). The permanent use of water sources near the settlements creates novel conflicts with the local and sensitive wildlife, as water sources are scarce in the overall plateau and the breeding of migratory birds primarily occurs in these restricted habitats. 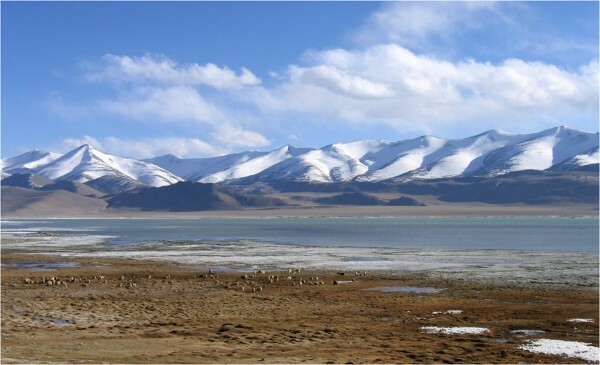 The Tso Kar and Tso Moriri are both proposed as protected areas within the ‘Changthang Wildlife Sanctuary’ and are of prime biodiversity importance. Hence, in areas where biodiversity conservation is also a societal priority, competition between wild and domestic herbivores becomes an important land and resource management issue in changing the natural resource use patterns of the domestic herbivores. Pasture use changes by Rupshus that have resulted in increased rangeland exploitation by livestock are likely to have significant consequences for wild herbivore populations, as has been seen in other areas of the trans-Himalayan belt, through both forage use overlap (Mishra et al. 2002, 2004; Bagchi et al. 2004) and interference competition (Raghavan 2003; Namgail et al. 2007b). Pastoralists are becoming increasingly intolerant of wild herbivores that use the same pastures, for instance the kiangs are commonly being driven away from the pastures (Bhatnagar et al. 2006a, b). The Tibetan gazelle (Procapra picticaudata), which historically occurred in the Tso Kar basin, became locally extinct during the 1980s due to hunting pressure, but livestock grazing seems to have prevented its recovery (Bhatnagar et al. 2006a). Another key evidence of the changing state of the ecological stakeholders is the change in predation habits of wolves (Canis lupus chanco) and snow leopards (Panthera uncia), which are increasingly preying on domestic livestock (Namgail et al. 2007b; our interviews). On the other hand, herding dogs that accompany the pastoralists are observed to chase and kill lambs and juveniles of wild herbivores (Singh 2008). Dog numbers also seem to be increasing along with the increase in herding families. However, it is difficult to delineate how much wild or domestic predators affect the dynamics of the ecosystem. Some innovative schemes are being tested in the areas that have intense livestock-predator conflicts, which aim to provide a self-organised insurance of livestock against predation to prevent retaliatory killing of predators (Mishra et al. 2002, 2004; Namgail et al. 2007b). The Snow Leopard Trust, USA (SLT), the Nature Conservation Foundation, India (NCF) and local herders in the Spiti village of Himachal Pradesh, India, run a village-based insurance programme for valuable large livestock such as yaks, cattle and horses. The basis of the programme is to reduce the livestock loss through better herding and to increase populations of wild prey for snow leopards and wolves, to compensate the total cost of the animal lost through insurance and to improve awareness among the herders. A local insurance committee comprising of the villagers collects premiums from the herders, based on locally set values (e.g. Rs. 30 per month ~ US$ 0.50 per adult yak and Rs. 50 ~ US$ 0.80 per month per yak calf as it is more vulnerable). There are additional annual contributions from the SLT-NCF, which should be higher than the total premium collection for the first five years and that for a given year the villagers should not use more than 50% of the annual collection. The programme has now been replicated in four village clusters (about ten villages with about 250 households) in Spiti and Ladakh, insuring over 500 animals with a value of approximately US$ 100,000. As part of the programme, the herders have also agreed to set aside grazing areas for the wild prey species. The villager receives a fee that is based on the fair market rent for grazing land in the area. Prey species populations have increased over threefold in five years due to one such reserve, which is likely to reduce the snow leopard's dependence on domestic livestock (Trivedi 2006). The trans-Himalayan high-altitude rangelands of India in the Jammu and Kashmir State have experienced recent changes on different spatial scales, from political boundaries, annual and seasonal pastures, to villages; social scales such as pastoralist groups (within and between), individual families and individuals; and temporal scales such as decades, years and seasons. These changes have been triggered by local political reorganisations in the pastoralist groups, international conflicts between India and China and Indian national development policies. Combined with internal conflicts among the pastoralists, these changes have had a cascading effect on the livestock, pasture use and the wildlife in the region, as well as the interactions among these. Traditional pastoralism has shifted from nomadic and low-intensity exploitation to sedentarization on a restricted area, a pattern shared with many other pastoral systems (Khazanov 1994; Næss 2013). The necessary adjustments for pastoralists in the Rupshu study area to these changes have been dramatic. Coupled with the effects of the government's developmental interventions, this has led to social and economic changes for the pastoralists, through division of wealth and families and emigration to urban areas, along with increased market production of cashmere, but with a lower per capita ownership of livestock and an increase in non-pastoralist work opportunities. In such a situation, the role of the village heads (goba) as the primary decision maker of timing and movement patterns of the pastoralists is also becoming insignificant as the pastoralists become sedentary and families move out. For a pastoralist society which is centuries old, these changes have occurred in a rather short time span, transforming the Rupshu way of life. The long-term sustainability of current intensified herding patterns is questionable. If an increased standard of living is to occur, having fewer pastoralists may be the only solution. The alternate livelihood options and the trend of young people abandoning a pastoralist way of life may bring this about. Development programmes should possibly concentrate on enhancing income opportunities for herders so that there is a greater diversity of employment opportunities for them locally as well as in nearby rural or urban centres. With technological innovations such as irrigated fodder fields in previously uncultivated areas, water wells to promote pasture use in previously little-used rangelands and better veterinary care for livestock, higher than traditional livestock densities may be sustainable against climatic extreme events and still allow for viable wildlife populations. Such an outcome, however, also depends on what climate change brings to the region for increasing temperatures without an increase in precipitation may negatively affect vegetation primary production (Xu et al. 2009). If biodiversity values are prioritised, technological innovations that increase efficiency of rangeland exploitation need to be balanced against conservation goals, but with compensatory benefits through, e.g. tourism accruing to local residents. We present this study as a model to demonstrate the consequences of socio-political reorganisation in pastoralist groups, together with changes in pasture use patterns, as a set of multiple events that created a shift in the traditional pastoral practices to an alternative ‘state’ in which the three main ecological stakeholders are affected. Nevertheless, changes to the pastoralist life in Rupshus continue at a rapid pace, and the effects on rangeland exploitation and sustainability are difficult to predict. In the face of uncertainty, development of frameworks integrating scenarios, ecosystem services and economic as well as cultural values into decision making is an urgent societal need. The Rufford Foundation for Nature Conservation (UK) and the University of Tromsø provided support for the fieldwork. The Research Council of Norway (through the International Polar Year Project ‘Arctic Predators’) provided additional financial assistance. We thank the Departments of Wildlife Protection and Sheep Husbandry, Jammu and Kashmir, India for permissions to conduct the fieldwork. E.J. Milner-Gulland, Roy Behnke, Manju Sharma and two anonymous reviewers provided valuable comments that greatly improved the manuscript. NJS, NGY, YVB, JF and NL designed the study. NS collected the data, and all authors contributed to writing the manuscript. All authors read and approved the final manuscript.